We always look forward to a visit by Carolyn Haines, a Mississippi native currently residing on a farm outside of Mobile. She's laidback, hilarious, and her books sell. And she always brings a group of her rowdy friends, who are also hilarious. 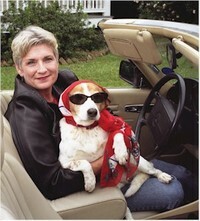 She's up to number eight with her latest in the Mississippi Delta mystery series, Wishbones. Fans of off-kilter, humorous mystery series, such as those of Janet Evanovich and Charlaine Harris, arrive in greater numbers with the release of each new book, and we couldn't be happier for Carolyn's success. Also, cheers to her for recently winning the 2009 Richard Wright Award for Literary Excellence. We caught up with Carolyn as she was embarking on a quick run through Mississippi, including a stop here at Turnrow on Friday night. Her tours are always fast and furious so she can get back and feed all of her animals. Turnrow Book Co.: What have you been reading this summer? Carolyn Haines: I just finished James Lee Burke's latest, Swan Peak. He is simply wonderful. And I read Nathan Singer's In the Light of You, a very powerful book. TBC: Whenever you're here, you always have great animal stories to share. I know you're a big animal lover. What's the best animal character in fiction? Haines: Oh, that's so unfair. That's like asking me to name my best friend. Depends on whether I need someone to bond me out of jail or someone to go ballroom dancing with me. TBC: Any new developments to report in your Southern Belle series? Haines: Wishbones is going great. My readers are the best — they "hook" other readers. We have to be careful or the DEA will be after us. TBC: How does a girl from piney woods region of Mississippi come to write about the Delta? In your estimation, how is it different from the rest of the state? Haines: The Delta has a unique magic that speaks to a part of me deeply connected to the land. The contrasts of rich and poor, so fertile and yet so blazingly barren in the sweep of the vista — these things excite my imagination. I love my neck of the woods, too. The piney region has a charm all its own, but it is very different. That's the thing about Mississippi. It's never what one expects it to be. TBC: One of your recurring characters is from the spirit world. Have you had any experiences with the paranormal world you'd care to share? Haines: I've seen ghosts twice in my adult life. Both times scared the stew (a polite word) out of me. In one instance, I bought a truck at auction and discovered one night, while hunting for one of my wayward cats, that a man in a plaid shirt was sitting behind the driver's wheel. I saw him several times, and he kept trying to talk to me. I'll tell the other "ghost" stories at the signing, if anyone is interested. I have some funny one courtesy of my parents. Come out to Turnrow and hear Carolyn Haines this Friday, August 8, at 5:30 p.m.